Braxton Hicks Contractions May Start to Become More Frequent and Intensify. At week 34 of pregnancy your body will be preparing itself for labour. You may begin to feel many more Braxton Hicks contractions that will start to intensify and feel less like practice. Your uterus now measures approximately 14cms from the top of your belly button, however you may look larger or smaller than other woman at the same stage of pregnancy. Every woman carries differently and the size of your tummy does not necessarily relate to the size of your baby. Someone that looks very small can still have a very large baby! You may also like to read about the different stages of labour and prepare yourself mentally for the birth of your baby. If you begin to feel nervous about the delivery of your baby you will find that the more informed you are about the process the less anxious you are. Try not to worry about the size of your baby if you are small, despite your size your body was designed for this and you are capable of delivering a large baby. Vice versa, just because you are large does not mean that you will have a 12 pound baby! Most babies know just how big to grow so that they fit through the birth canal. Everything about pregnancy is designed in a certain way to just work, so do not let yourself worry as women have been giving birth for centuries. By this stage as your baby moves lower into your pelvis you may feel like he/she is going to fall out! If only it was that simple. You may notice that your belly looks lower as your baby descends into your pelvis ready for birth. You will find that the pressure you once felt on your chest is relieved and it is now much easier to breath and your breasts may no longer be resting on your belly. Heartburn and indigestion may also be reduced as your baby moves lower. Good news is that generally once your baby has dropped they will remain there until birth. However it isn’t all good news, you may feel some uncomfortable pressure from your baby moving lower and find yourself going to the bathroom even more frequently (if that’s even possible) as your baby rests on your bladder. As your pelvic joints loosen and prepare for labour, you may have noticed a tingling sensation or numbness in your pelvic region or pain when you walk. Speak with your obstetrician or midwife if you are terribly uncomfortable. If You Notice Any Vaginal Bleeding Contact Your Hospital, Obstetrician or Midwife. By 34 weeks of pregnancy if you notice any vaginal bleeding you should contact your hospital, obstetrician or midwife. Bleeding can be a sign of an inflamed cervix (common during pregnancy) or more seriously could be a sign of placental abruption. While very rare (affecting only 1 in every 100 pregnancies) it is where the placenta pulls away from the uterine wall. Bleeding is the most common symptom of placental abruption and can deprive your baby of nutrients and oxygen. Other symptoms of this condition include frequent contractions, uterine tenderness, stomach and lower back pain. All bleeding in the third trimester should be taken very seriously and not over looked. Your baby by week 34 will weigh approximately 2.2kgs and measure 45cms from head to toe!! Pretty incredible considering how small he/she was only a few months ago. And believe it or not, your baby is still filling out getting rounder and rounder. A Doctor Will Examine You on Both Ultrasound and Manually to Check your Baby's Position and Size. Estimating the size of your baby is often something that pregnant women try to do to put their mind at ease for labour. However these estimations can often be out by as much as a pound! An ultrasound can be helpful to determine the size and weight of your baby however can still be inaccurate. A doctor might also look at the diameter of your baby’s head to help determine how large your baby will be for delivery; once again this is just an estimation. They have come along way, and now respond just like a newborn baby. From the small things such as opening his/her eyes when awake and closing them when asleep to being able to grasp firmly. Your baby has grown in so many ways, he/she has fingernails that you will have to trim only a few days after birth. At 34 weeks of pregnancy your baby is developing, building antibodies and building up immunities to fight mild infection. At week 34 your baby will have lost most of the lanugo hair that once covered the entire body while the layer of vernix thickens. 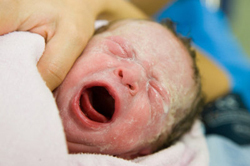 After birth you may notice that your baby has a white, waxy build up in the skins creases such as behind the ears, in the under arms and behind the knees – this is some of the remnants of the vernix. Is your baby moving less? Perhaps you have noticed your baby has hiccups more so now that your baby is less active. Hiccups are not a concern and you should not worry that your baby is in pain or feeling discomfort. Although the reason for hiccups in utero is unknown, some say that they could be helping to strengthen your baby’s diaphragm muscles to assist with breathing both in the womb and once your baby is born. Hiccups are something that you can look forward to everyday as your bub moves less as he/she grows. Your baby once born may also continue to hiccup at the same time each day! Some babies that did not have hiccups in utero will often experience them as early as the day they are born.